Her riff of the TV news image uses a clever analogy to explain why climate change has affected the polar vortex. It reminded me of an issue in science communication: how do you reach those who never watch or read science news? There‘s a suggestion in the science communication literature that most adults get their science information from entertainment. The thing there is that they’re not looking for science, they’re looking for entertainment and whatever science they get is on the by-and-by. 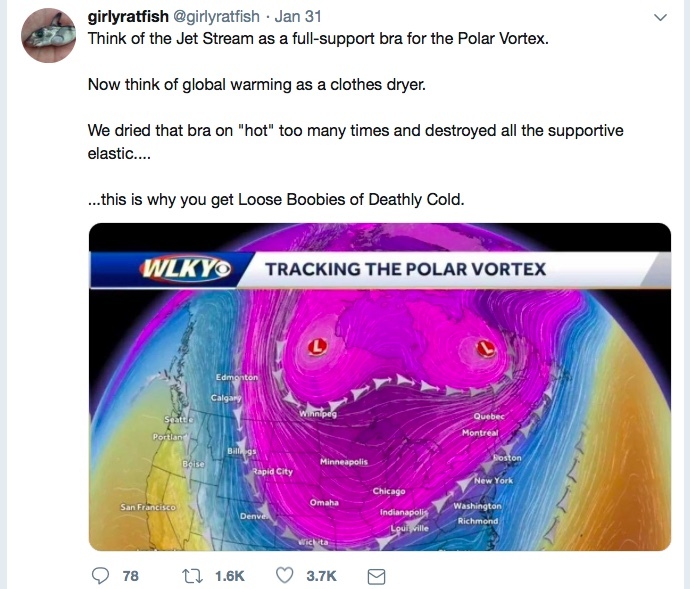 Think of the Polar Vortex as a full-support bra keeping cold air up in the icy north. …this is why you get Loose Boobies of Deathly Cold. My retake might not have quite the same punch as girlyratfish’s, but you’d still guess our not-seeking-science gal is going to prefer it to the PBS title and lede. A lot of what we do likely mostly reaches those already seeking science. There’s nothing wrong with that in itself. That stuff should continue. I’m certainly not going to be stopping my part of it! But how do you reach the rest? Humour and entertainment are obvious candidates. But for wider topics, it’s a thought. Can you present humour or entertainment first, and run the science within or after it? It’s important that what you are “selling” to the reader (viewer) is entertainment or humour, and that the science comes second. That might not be natural for science communicators. We want to talk about the science! But it might be more effective at reaching not-seeking-science people. In biology—what I cover—it’s not uncommon to play on quirky features of animals, say, then explain them and lead to a deeper story. That still doesn’t quite go as far as I’m thinking of here. There the humour and entertainment isn’t first so much as concurrent. (And readers will know they’re being played, too; I suspect geeks buy into that more readily.) At least it reaches out past what a serious ‘explainer’ might offer. I hope to write more on science writing in later posts. Feel free to offer your thoughts in the comments. Scientific paper has a face in a turd. Who could it be? That’s the real one. And what it often gets used wrongly for is to the talk about the jet stream, which is much lower in the atmosphere. It is really what creates all of our weather that we feel down here on the surface. It is also a river of wind that flows around the Northern Hemisphere, but at a much lower level. So there are these two spinning rivers of wind up over the Northern Hemisphere that control our weather. And right now, the true polar vortex has actually split into two, which doesn’t happen very often. And one of those lobes of cold air that is normally is bottled up over the North Pole has drifted down over North America and brought all that cold air with it. I’ve based my revised ‘Loose Boobies’ tale on Dr. Francis’ explanation. I hope I’m doing justification to the atmospheric science: my turf is biology! I am wondering what other variables are involved when it comes to the polar vortex. The earths magnetic field is also weakening. Or is everything to be attributed to anthropogenic warming?